154 Hidden Court: Someone brought a gun to my kid's school, but I'm not really upset about it. Someone brought a gun to my kid's school, but I'm not really upset about it. When Zachary came home from school Friday, we immediately went into "hurry up" mode like we often do in order to make it to his 4pm tae kwon do class, which is several miles away. I did the hurried "How was your day?" bit in the car, but the rush rush rush of moving from one place to another - always somewhere to go, somewhere to be, it seems, kept me from delving too deeply below the surface of general "What color did you get to? (on the behavior chart)" and "What did you have for lunch?" kinds of questions. It wasn't until later that night - much later, in fact, that I started digging through his backpack, past all the random scraps of paper, broken pencils and other unidentifiable things to see if there was anything I needed to sign or send back that I saw the letter. "We want to make you aware of a situation that occurred today at SCHOOL'S NAME. 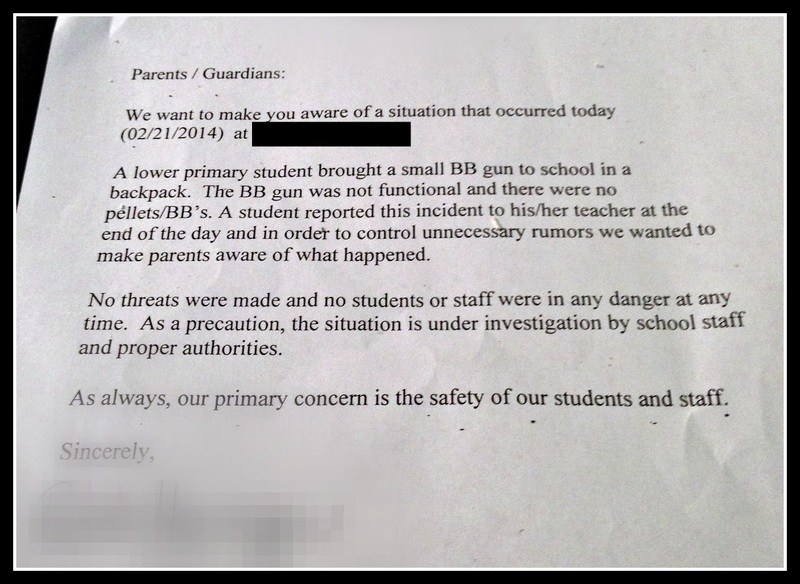 A lower primary student brought a small BB gun to school in a backpack. The BB gun was not functional and there were no pellets/BBs. A student reported the incident to his/her teacher at the end of the day and in order to control unnecessary rumors we wanted to make parents aware of what happened. No threats were made and no students or staff were in any danger at any time. As a precaution, the situation is under investigation by school staff and proper authorities. As always, our primary concern is the safety of our students and staff. " I read it a couple times before it really registered with me what it was saying. Someone had a gun at my kid's school. 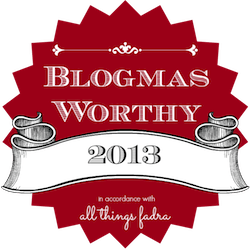 I felt that weird hotness across my face and the heaviness of my legs that accompanies sudden fear, and I had to sit down. I'm not one to overreact in most situations, but still. A gun. My kid's school. I wanted to be angry. I wanted to lash out. I wanted to blame someone. I wanted to call and email and march and demand answers, but I couldn't. After the initial shock passed, I couldn't really muster up more that a vague feeling of unease. It had happened. It had been dealt with. No real harm was done. I called Zachary to me and we talked some more about his day at school. When I asked him if anything out of the ordinary had happened, he talked of a nosebleed a classmate had had on the bus and something new that had been served in the cafeteria. This thing - this thing that could have been so massive - wasn't even a blip on his screen. This was last week, and I've thought about it a lot since then, but not with the anger I first imagined I would feel. Even if I were angry, I didn't really have anyone in particular to be angry at. I can't be angry at the school or the teachers or the principal. By all accounts it was handled swiftly and appropriately. I couldn't really be angry at the kid. Even though he or she was the one who brought this BB gun to school, I know all too easily how this could happen. Last year, unknown to me, Zachary sneaked some Pokemon cards into his backpack and took them to school, which he knew wasn't allowed. They were confiscated by the eagle-eyed bus driver and returned at the end of the week with a note saying next time she would keep them. Fine by me. Zack knew he wasn't supposed to take them to school in the first place, but he did anyway and it totally slipped under my radar. It was easy enough for him to do with Pokemon cards, and a "small BB gun" is probably easy enough to hide in the same way. I could be angry with the kid's parents, I guess. I really could. But I don't know their story. I don't know what they have going on in their lives. What I do know is that in the area in which I choose to live, guns of all types and sizes are common. Very common. I live five miles from a major military base, which means guns galore. It's also a rural area, and hunting is just... understood. Where I live, kids grow up knowing how to handle firearms. Kids go hunting. And yes, kids play with BB guns. Despite any feelings I may or may not have about it, it just IS. I understand that is not the norm everywhere, but here it is. Maybe it was lax of the parents to have this BB gun in a place where the kid could get to it without supervision. Maybe not. Maybe the kid broke through 15 locks to get it. I don't know the whole story, and I never will. Guns are as common as Pokemon cards here. As much as I WANT to be angry, I completely understand how it could have happened. I've spent a lot of time thinking about it since last week, so I think I understand the significance of what did and did not happen, but at the same time, mostly I'm just relieved that it didn't turn out to be a bigger deal than it was. Everybody is safe. Nothing terrible happened, except in the overactive imaginations of a few teachers and parents. Everyone is fine. And it's hard to be angry about that. I think your reaction was normal. You went through the gamet of emotions and feelings and you talked to your child about what he knew and that's really all you can do. As you stated, you don't know that family's situation and unless you know the family, you may never know what led up to this. It just really isn't going to be productive for you to continue to worry about it. I'm so happy that you were able to rationalize in your mind and process it all without overreacting. I'm sure there were enough parents who weren't so cool-headed that the school had to deal with and you didn't add to that chaos. Good job, Mom! Everyone is fine- definitely what to focus on. When I think of a bb gun, I think of something that wouldn't fit into a backpack. Now I'm imagining some small nerf gun or something. Our schools here have a zero-tolerance 365 day suspension for guns or "gun likenesses" on school property, meaning you even draw one and you are gone for a full 365 days. I'm glad they take it seriously. That said..
We just have water guns here. They don't fit in our kids' backpacks, but I could imagine if they did, my boys might try to sneak them into their bags. My middle son has (unbeknownst to me) taken random toys to school in his backpack. I could see him taking something that was considered inappropriate, without realizing it was inappropriate. I think I would have gone through the same emotions you do. That being said, any guns, including BB guns, are immediately put away when not in use. I haven't had any trouble with my children with that and I hope to keep it that way. I think your school handled it admirably. I have zero tolerance for schools with zero tolerance policies. Yes, it makes it easier to handle issues, but sometimes stuff happens. A few years ago, a high ranking (top 10) graduating senior was not allowed to graduate because of a zero tolerance policy. She was 18 and have moved the weekend before to her own apartment. Apparently while she was moving,a butter knife fell out of box and onto the floor of the rear seat of her car. Someone spotted it in the school parking lot, and she did not get to graduate because of their zero tolerance policy. I think that no likenesses of guns at all is ridiculous - how do we show the children soldiers etc. It's just the times we live in. When we were kids, if someone brought a BB gun to school, no one would have thought a thing about it. It's a shame really. And it makes me angry that we are forced to now be frightened when something like this happens. And for good reason. I would have probably reacted the same way you did. It's hard to judge when you don't know the situation. Yup, I think I'd feel the same as you. As far as I know, no one has brought a gun to my children's school before, but I wouldn't be surprised if a toy one popped up one day. It sounds to me like the school handled the situation quickly, and I'm glad they notified parents of what happened. I'm not picturing a BB gun that is small enough for a kid to smuggle to school in a backpack, though! You reacted pretty much how I would, and for similar reasons. There are guns all over the place here, as well. I am glad your son's school was on top of the situation! love the way you handled your thought. As a teacher parents react on their first thoughts and a lot of times we get the backlash. I love that you sorted through your emotions. As a mother I would be scared too but in the end nothing happened and theirs nothing that can change it now Kudos to you! The principal is brand new - like three days on the job when this happened. I really feel for her. I bet she's been doing nothing except managing this since it happened. Thanks for stopping by! It is really complicated, isn't it? For me, it's complicated by the fact that I can see EXACTLY how it could happen, and how it could be my kid who did something like that. I'm glad schools take it seriously, too, but zero tolerance seems like sometimes it means not using common sense, ya know? There is such a difference between zero tolerance and using common sense. That poor girl. What harm could she have possibly been planning with a BUTTER KNIFE? That falls into the category of ridiculous. I know. I remember in elementary school pocket knives and such got confiscated by the teacher all the time. All the boys (and some of the girls) had them. They were always given back at the end of the day though. It's just a different world we live in now. I guess I was surprised because it's a primary school - grades K-3. I shouldn't have been, though. Like I said, guns are everywhere around here. I had to Google it myself because my mind immediately went to the really long ones I remember as a kid, but apparently there are all manners, shapes and sizes now, and plenty out there that look just like pistols. I'm really glad they notified us right away. It's not the kind of thing you want to hear about on the local news. I like how the school handled it. Level headed, and without overreacting. If they would have overreacted, I think the uproar and backlash to them would have been much worse. Thank you! I totally agree - teachers are often charged with bearing the brunt of whatever happens at a school, even if it really doesn't pertain to them. It sounds to me that everyone here did a good job of staying cool and handling this with some common sense, and that made a huge difference in my ability to work through it. If the school would have gone into panic mode, I might have, too. I always say it could happen, but when that becomes a reality - nothing can prepare you for that! So glad everyone was ok! Thanks so much. I was definitely NOT prepared. The oldest kid in this school is maybe 10. It's just kinda crazy. I live in the town next door to Sandy Hook. My parents were visiting from NC and my daughter was home sick from school. We all watched it unfold on the news. All of it was happening not 10 miles away. It was the worst feeling. I remember just crying and crying for days. And every time I drive down the highway and see the exit sign for Sandy Hook, it all comes back. Can you imagine? What this one man did? One man with a gun. The sign of the times. Getting into fist fights in the hallway or playground was the most we had to worry about. No one would have ever thought of bringing a real gun to school and actually using it. It all just makes me so sick. "Let's just go and kill people." Never a thought. Never. What happened? So well put, MJ. It boils down to that sense of vulnerability. We live with it just under the surface all of the time, but we are never more aware of it than when we feel vulnerable for or about our kids. I can't imagine what that is like for you, to see that reminder on a daily basis. I wonder all the time if we are that much worse off as a society, or if somehow the readiness of information about tragedies like these make it SEEM worse, or somehow prompt the ideas in others. Sending my kids out into the world every day is the hardest thing I have ever had to do. You're right. It's just the sense of vulnerability when it comes to our kids that makes us both weak and strong, I think. I am not an alarmist, and I share your concern but understanding stance on this issue. I am not a gun lover at any level, but we don't always know the whole story. When I see parents freak out about things like this, I wonder what their children are learning. Usually you can see it by how the children behave.